For member Baylor Wilhelm, it started with a goal – the desire to be in the Navy. Taking the traditional path right out of high school into college, Baylor thought earning a degree was the way to go. He quickly realized, however, that he didn’t like school all that much and he had no desire to sit in classes all day, learning about things that didn’t really interest him. In his first and only year of college, Baylor gained a lot of weight, drank too much and was eating only quick, fast, and unhealthy foods. Fed-up with school and his weight, he spoke with a friend who shared with him his experience in the Navy as part of the Military Police. From these stories, Baylor had found his new goal, his drive, and his passion to be more than a 6 foot, 295 pound bored college student. 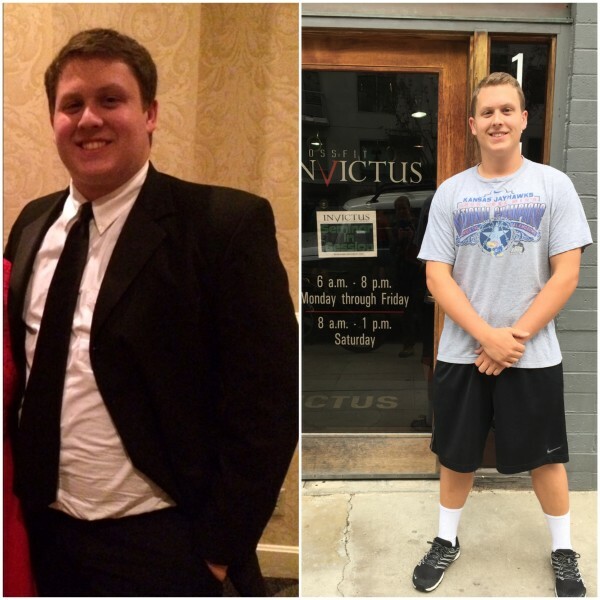 In January 2015, Baylor started to lose weight by getting back to the basics of physical activity and eating better. In high school he had played football for the 2014 Oklahoma Football State Champs, so he knew how to move. When Baylor joined Invictus, he weighed 245 lbs and was 2% over the body fat requirement for the Navy. Today, just three months after his start date with us, Baylor is now 213 lbs and has passed his physical! In just six short months, Baylor went on to lose a total of 88 lbs. He says, of course, that he’s noticed the physical changes in his body but his mood and energy are the most positive and life altering changes. When he was overweight, he felt tired and apathetic all the time. Just when things seemed to be aligning for Baylor, though, he was quickly overcome with another obstacle. He had passed his physical for the Navy but, as a baby, Baylor had to have metal tubes placed in his ear due to a rupture. Given this information, the Navy told Baylor that the tube and hole in his ear would leave him vulnerable and the Navy would not be able to accept Baylor. Baylor was devastated. What was he going to do with his life now? He was at a crossroads and had the option of going back to his old ways, giving up and letting the rejection from the Navy pack the weight back on, or he could use the momentum he had built up and put energy towards a new goal. Congrats on all of your hard work, Baylor, and good luck with all of your future goals!